SDQscore ✉ CONTACT US SDQ education & training Schools and SDQ Australian SDQs Free Book! Longitudinal/chronological SDQ scores for individual young people? Long and short term monitoring and follow-up? Improved, structured clinical interactions with young people? Learn more about using the free SDQplus and SDQblockchain applications. 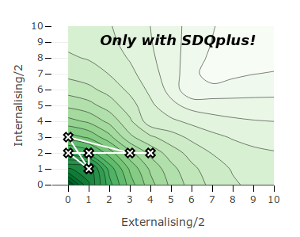 SDQplus now includes artificial intelligence (AI) applications for analysing individual young people's SDQ scores and prioritising group assessments. Now with Session by Session! Fees started on 1 March 2017. Please purchase credit to avoid delays and "No Credit" messages! See about costs, payments, registration and administration. There is a video about registration and payment. See our Facebook page, too.